Our firstborn, Bloodlines Touch Not the Cat, ends with a prologue to the sequel describing a birth. We never could have guessed how appropriate this would prove to be. Writing a sequel, we have learned, is more challenging than we ever could have anticipated. Truth be said we never anticipated anything really. ‘Bloodlines’ was an ‘accident’ as it is. An afternoon chat about a dream, turning into a storyline, converted into a short story and eventually turned into a book. 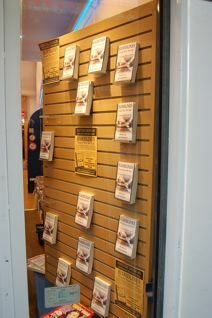 We were sort of surprised ourselves when we were standing in front of the American Book Center on 11.11.11, the night of the launch, staring at both windows of the shop decorated with a display of 20 copies of Bloodlines Touch Not the Cat. While writing our debut we were faced with the decision whether we wanted to have 300 + or 500 + pages novel. What we decided in the end was to take out the overflow of ideas and keep them for a sequel. Our readers responded differently to the effect that had on the storyline. 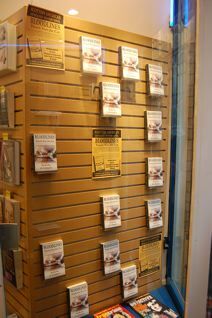 On the one hand we were told the book was a page turner, with many commenting they ‘couldn’t put it down’. On the other we’ve had comments of readers regretting they hadn’t learned more about ‘what happened next’ to Katherine and Alexander. Hopefully it will please both groups to know Bloodlines- Traces will reveal more. The process of writing a sequel however was just as new to us as writing the first one. Questions rose like: ‘how does one write a sequel, without repeating what happened in the first book’? We also encountered unanticipated mistakes, (especially made in genealogy-writing), like siblings being born too early or too late to play the part we had in mind for them. Strange as it may sound, what we also learned is that much like with ‘real children’, authors actually never know what their storylines will do. Characters are like teenagers. They bolt when they don’t agree with the turn their live is taking and more often than not they set out their own path defying their authors well meant intentions. All in all the learning curve was enormous. The one prerequisite to get a book written however was there: we enormously enjoyed it. The feedback he gave us on Bloodlines Traces was just as rewarding with a perfect balance between the authors wanting to get very drunk and forget about the whole thing and eager to get started and implement the improvements. We’re happy to say we are doing the latter, but – there’s always a but isn’t there- since this is again a learning process, we have decided to postpone publication of Bloodlines Traces to October 2014. Apologizing for too much enthusiasm, i.e. our promise to publish in April is basically a positive when you think about it. We sincerely hope you’ll bear with us for half a year more. And when is the sequel going to be available?? I found Bloodlines – Touch not the cat, read it and want to read the sequel, as I also am curious what happened to Katherine after she left Scotland and what Cathy will do in Scotland. I AM EDWARD MCKERLEY’S GRANDDAUGHTER. Hope to read the book.